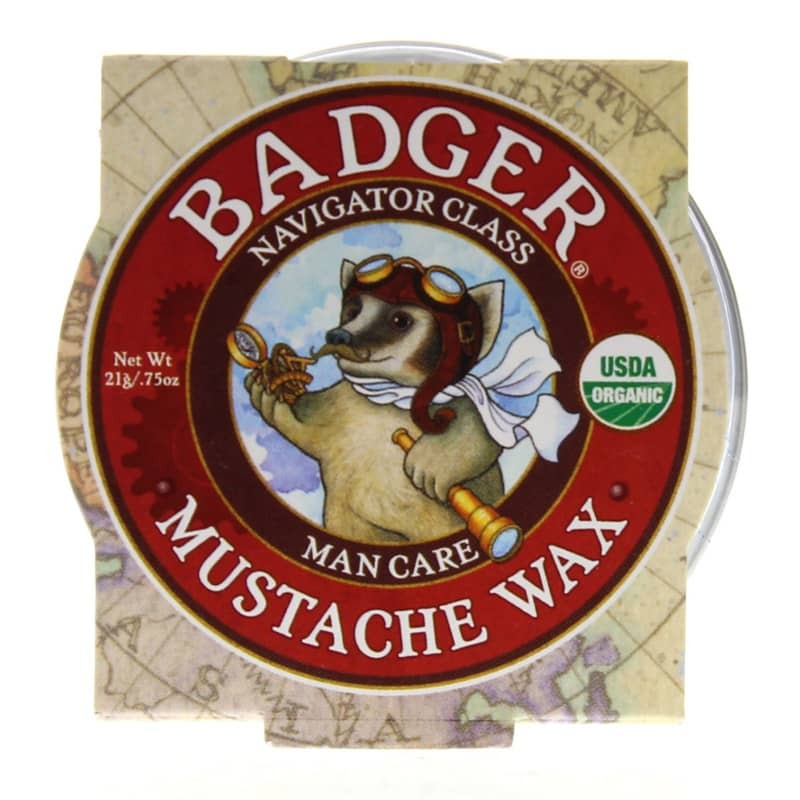 Badger's Man Care Mustache Wax is an all-natural, organic mustache wax that provides medium hold and quality ingredients for shine and manageability. 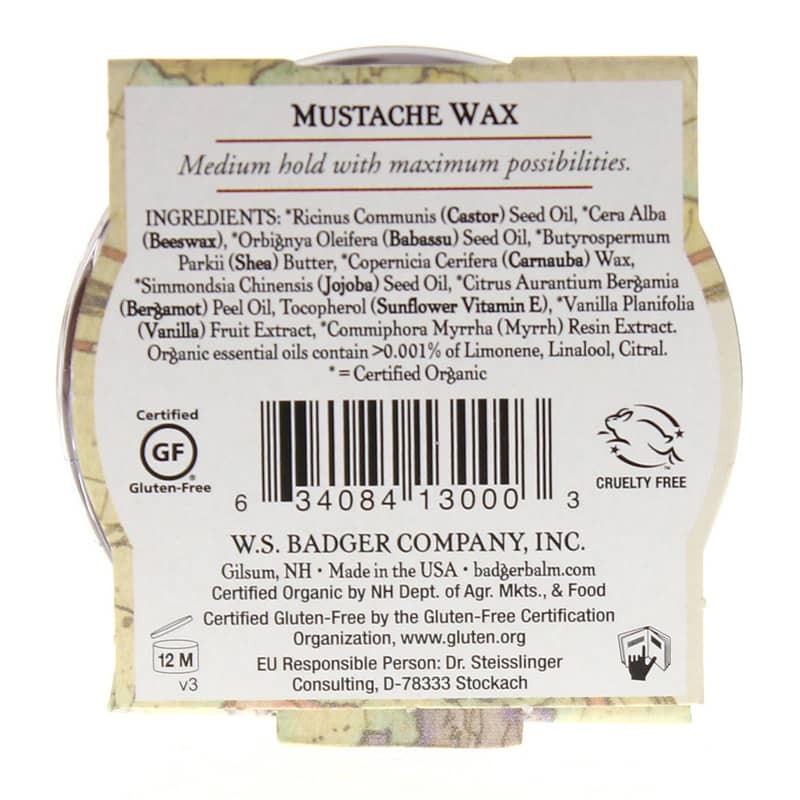 Certified organic and 100 natural, Man Care Mustache Wax uses the finest ingredients for conditioning and control. An extra-hard carnauba wax provides medium hold and a high gloss shine, and nourishing Western Shea Butter gives adhesion. This formula also includes natural beeswax, giving you optimal pliability. This flexibility makes it easy to restyle your mustache. Don't just have a mustache; own your mustache. Order Man Care Mustache Wax today. Contains NO: parabens, synthetics, GMOs, chemical or any other harsh ingredients. Melt a small amount in your hand and apply. Expect your mustache to generate powerful waves of good luck, clarity, confidence and calm. The wax is good. It's a bit hard to use but, once you figure it out. It's OK. Not as stiff as some, but easy to re-style after seversl hours. not good for handle bar mustaches. I bought this for my husband. The brand he currently uses has been causes a rash, so I wanted him to try something more natural. Bought this and he won't use it. He tried several times but found it VERY hard to use, plus it won't hold his stache. Would like to return but policy says no returns if opened. Too bad I could have bought it on Amazon, where returns are no questions asked, but I am trying to steer clear of Amazon for political reasons.<br>Oh well, lesson learned. Wouldn't buy it if you want an easy way to curl your mustache. The mustache wax works as expected. Shipping was free and quick, very satisfied!